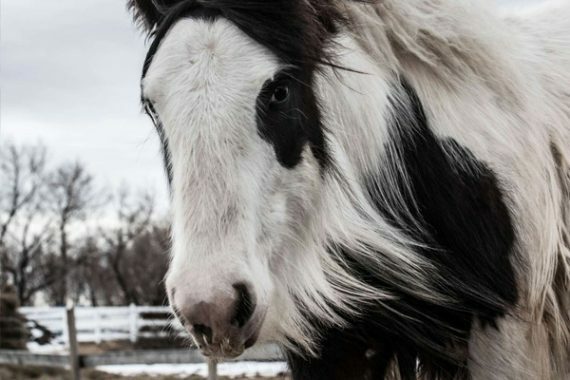 His Story: Sampson came to River Lane Ranch in December of 2017. He was Carmel’s first pick of all the Gypsy’s at River Lane Ranch. His calm demeanor, soft eyes, and loving gaze are just a few of things that drew him to her. His original name was Sarge and with North Fork’s permission, he soon was renamed Sampson, better to suit his long beautiful double mane of hair. As he continues to grow so does his feather and his bone and muscle. He has now begun his training at the ranch and shows us every single day that he will be a suitable partner for his owner. He is attentive and affectionate, ready for love when you want to give it. His confidence will help to take care of his rider and we don’t think there is much that will faze Sampson. Confident in himself and with his strength we are proud to own him.We believe he will caring on his Dam’s flowing stride and his sire SD Woolly Mammoth will bring the looks and personality to go along with him. Sampson is expected to mature to about 14.1hh.